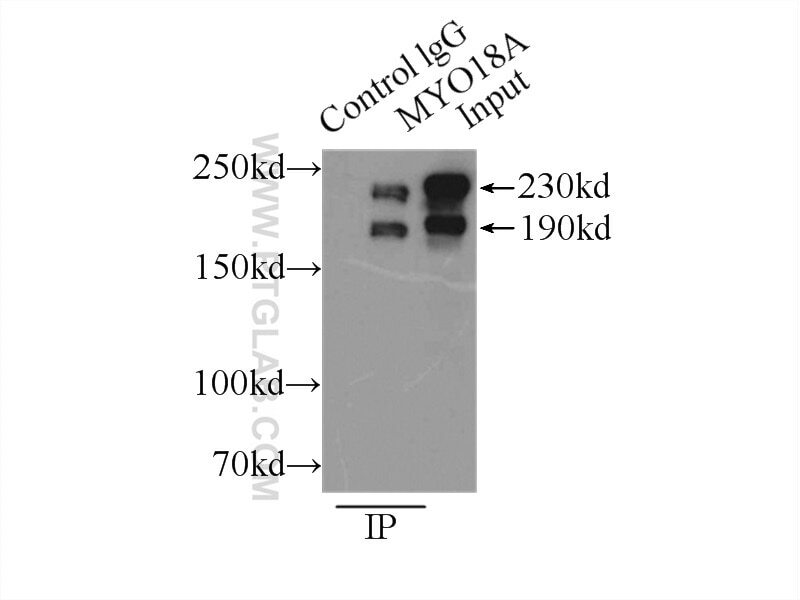 IP Result of anti-MYO18A (IP:14611-1-AP, 3ug; Detection:14611-1-AP 1:300) with HeLa cells lysate 3000ug. MYO18A is an unconventional myosin that may play a role in the stabilization and organization of the actin cytoskeleton. Recently MYO18A has been identified as the receptor of SP and is responsible for clearance of SP-A-opsonized bacteria in in vivo infection. Two different isoforms of mouse Myo18A have been identified: Myo18A-alpha and Myo18A-beta as 230- and 190-kD proteins, respectively.Myo18a-alpha colocalizes with the ER-Golgi complex and with membrane ruffles and filopodia, while Myo18a-beta localizes diffusely to the cytoplasm. Surfactant protein A (SP-A)-mediated clearance of Staphylococcus aureus involves binding of SP-A to the staphylococcal adhesin eap and the macrophage receptors SP-A receptor 210 and scavenger receptor class A.
GM-CSF modulates pulmonary resistance to influenza A infection. Identification of CD245 as myosin 18A, a receptor for surfactant A: A novel pathway for activating human NK lymphocytes.